If you've ever wanted to see a baby in a martial arts fight with a stuffed animal, today is your day. 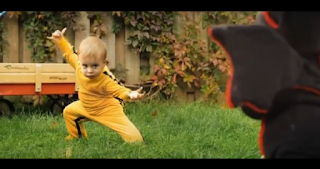 This video "Dragon Baby" turns an innocent little boy into a Kung Fu warrior. No relation to Bruce Lee, so maybe he'll grow up to do another movie without dying on the set. Yeah, I went there. That's a funny video. As someone who has a little bit of knowledge about making videos, that baby vid was difficut to make but turned out great. I need to teach my niece how to do that. Yep. Character, conflict, choice. It's pretty much all you need, unless, you know, you break the rules and make it work anyway.